TROY — Altair (Nasdaq: ALTR), the Troy-based engineering technology developer, announced lower prices for startups on its simulation-driven design, computer-aided engineering, cloud computing and Internet of Things software products through a new Altair Startup Program. 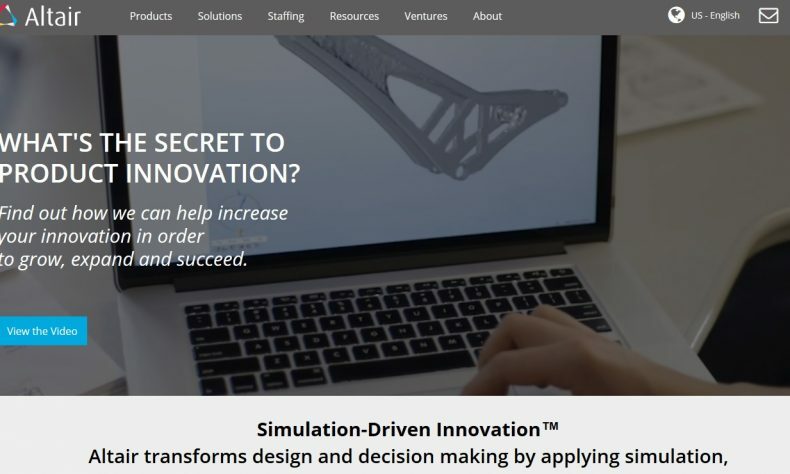 The company also said the program also provides no-cost expert consulting to quickly ramp up startup organizations with the industry’s leading multi-physics optimization platform, Altair HyperWorks, used by thousands of manufacturers worldwide. The program includes full-featured access to all Altair software titles, more than 150 Altair Partner Alliance software applications, instructor-led online self-paced training courses, expert consulting support and numerous co-marketing opportunities to build startup brand awareness. The Altair Startup Program is also available and can be customized for business incubators and accelerators who are interested in expanding the resources available to support startup portfolios. Companies falling outside of the Altair Startup Program qualification criteria may still apply for offers to get started with Altair solutions. For more information regarding the Startup Program, Altair is hosting a 30-minute webinar on Thursday, Aug. 2 at 1:30 p.m. Eastern time for startup organizations, incubators and accelerators, and startup funding and support ecosystem. Register here.